Today was our first day of getting up at 4am. 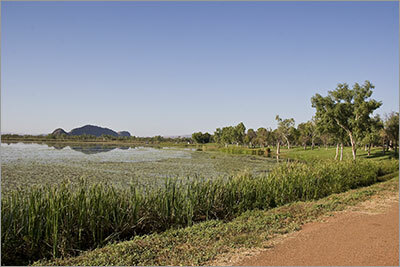 The 1.5 hour time difference between the Northern Territory and Western Australia means sunset is at 5.20pm so we have to get up 1.5 hours earlier to take advantage of the light. We left our cabin just after 7am and went to the Post Office to post some mail. 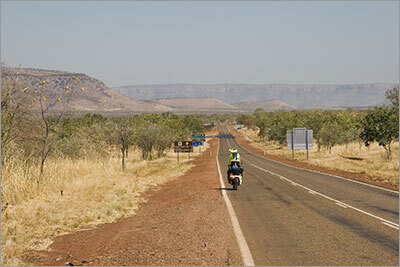 I then got a phone call, so by the time we rode out of Kununurra is was close to 7.30. Today’s ride was not that hard although it was very hot and the Great Northern Highway was easier than the Victoria Highway. Before turning onto the Great Northern Highway we did have a very smooth run over a dirt section of road works being controlled by stop/go flagmen. We both commented that this clay based dirt section was smoother and faster than the sealed road. 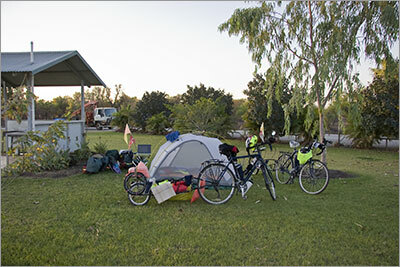 We stopped for morning tea at the rest area at the intersection of the Victoria Highway and the Great Northern Highway. This rest area was rather big and a bit of a dust bowl. 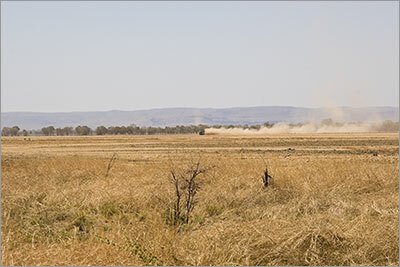 About 15 – 20 km along the Great Northern Highway we came across some very big dust clouds. This turned out to be a new irrigation ‘field’ being prepared as part of the Kingston Rest Tropical Forestry Services’ new Sandalwood plantation. Whilst I was taking photos, one of the workers came over to see what I was up to and gave me a quick explanation of what was going on. Apparently in the early mornings when they are working before the wind comes up, the dust hangs over the fields like fog. Today was another day of riding through spectacular scenery. The road winds its way between the hills and the climbing is very easy and gradual, although you do know you are climbing. The hills / mountains / ranges are a lot taller than we have seen for a long time. 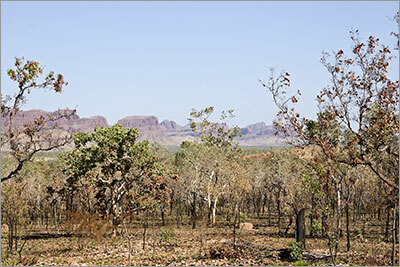 There are a big mix of mountain / hill types – Uluru style mountains, jagged ranges, long ranges with cliffs. All are a mix of colours, but the rich reds and oranges predominate. 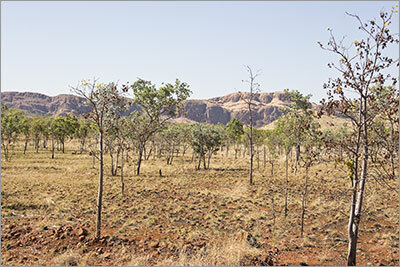 There are not many trees on these hills – well a lot less than the hills near the Victoria River Roadhouse. Photographs cannot convey the spectacle of this scenery. Denise felt the heat over the last 30km of road to Doon Doon Roadhouse and we arrived at approximately 3pm. Doon Doon Roadhouse is only open between 6am and 6pm so dinner was ordered at 5.15 and we ate at 5.30. 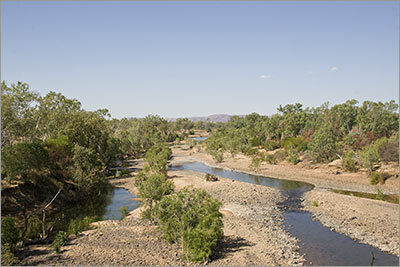 Doon Doon is a nice place to stay – the best roadhouse camp spot we have experienced so far. We pitched our tent for the first time without the fly so we will see if we sleep cooler and easier tonight. All the staff at the roadhouse were from overseas – UK, US, Taiwan and the owner is from the Netherlands. The Taiwanese girl served us and we were amused by the fact that she reinterpreted the rule “Please do not drive or park on the grass” to “Please do not ride or park your bikes on the grass.” We are not sure where we were meant to put our bikes then. 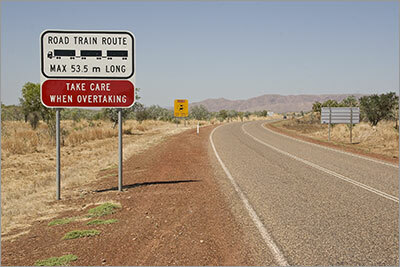 When we first encountered road trains in Queensland their length was 50m but as we have moved through the NT and WA they have gradually increased to 53.5 metres. Kingston Rest Tropical Forestry Services’ new Sandalwood plantation being levelled.